Egg is something that is versatile can be cooked for any meal of the day. I love it for breakfast lunch or dinner . And always comes to rescue when you don't have any other vegetables on hand. My mom used to make this recipe for us with chapatti when we used to travel . And now i cook this up for picnics. 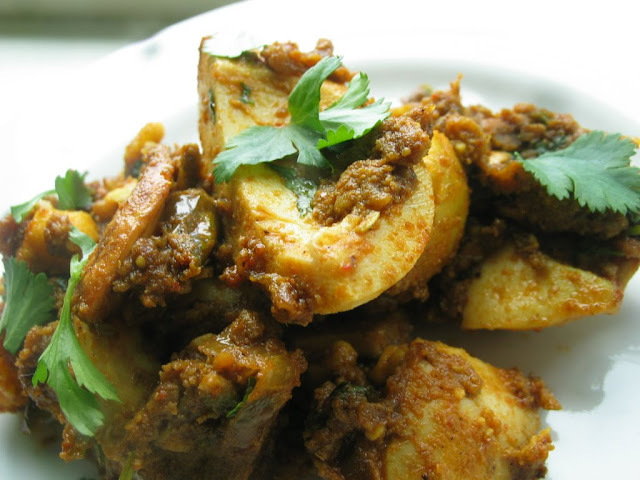 The yolk mixes with the onion and spices and makes a very yummy masala for boiled egg whites. 1. Heat oil and add onion and cook till onion turns translucent. 2. Add ginger and garlic and cook till onion turns golden. 3. Add fennel , turmeric , chili , coriander and mix well for few seconds. 4. Add the boiled egg and garam masala and mix well light handedly. 5. Garnish with coriander leaves and serve. nice egg masala..picture is perfectly taken. Adding fennel seeds is new to me. wow.. such a beauty. love to have with some appom now. looks sooooo tempting. Great shot. beauty meets the quality...truely divine.. Very tempting egg curry Nisha.. Egg Masala looks absolutely delicious..love it. Lovely egg curry with spicy flavour..Love that large size boiled egg white. egg masala looks delicious..want to try it one day.. Yummy!! Really tempting egg curry..Love it with chapatis..
Mmmm...my favourite. I also love sambal eggs. TH will love this, bookmarking the recipe. I can't resist a great egg masala like this one...miam miam..
Dry Egg Masala looks excellent. Would love to try it out soon.